As enchanting as coming across a hidden cottage in the countryside! 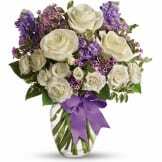 Lush white roses and purple stock mix with delicate lavender waxflower and green pitta negra for an elegant English garden look. The decorative bouquet is finished with a pretty satin ribbon. • White roses meet lavender stock and waxflower in this lush, elegant arrangement. 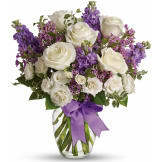 • Presented in a classic clear glass vase with purple satin ribbon. Flowers will be received by a Wake Memorial Park's staff. We purchased the Deluxe (Mid size) and they were beautiful, large and smelled wonderful. They were placed near the register book and everyone commented on their beauty. We were well satisfied with this arrangement. Beautiful !! Prettier than the picture. The arrangement filled the room with joy rather than sorrow. Not the usual funeral fare of gaudy sadness. A lush bouquet I wished could have taken home with me. My best friend's grandmother passed, and sine I'm on the other side of the country I had these delivered. I didn't see them, but she told me they were lovely. 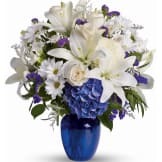 This arrangement was perfect for saying farewell to a dear cousin.It was also portable so the family could take it with them after the service to enjoy at home. 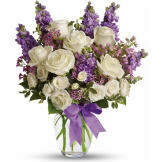 The flowers were fresh and the arrangement was just as beautiful as pictured. It was a graveside service and very windy, but the bouquet didn't lose a single petal. Well worth the money. 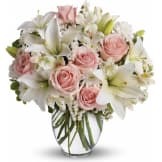 All of our flowers are designed and delivered by hand from a local florist in in Cary.